Sometimes in the midst of my incredibly busy life the door opens and I have a glimpse of what it is really all about. Quite often this happens on a Wednesday. On Wednesday evening I hear confessions and then say Mass. I celebrate the Mass ad orientem. It is the only time in the week I do so. I celebrate facing the same way as the people because I actually feel closer to them that way. I also feel closer to God. I celebrate most masses facing the people, but I have to admit that whenever I do, try as I might, I feel like I am on show – kind of like I am in entertainment mode. When I stand at the other side of the altar and face the Lord with the people I find that my own celebration of Mass is more intimate and mystical. I feel like I am able to focus more on the Lord and what is happening. If I need to weep I can do so without people seeing me. If I need to pause and pray I can do so without worrying what people are thinking. So this week on Wednesday evening as I celebrated Mass a strange awareness came over me. As I read the words from the missal it was as if the words themselves were alive and vivid. I cannot explain what I was seeing except to say that the words were thronged with the meaning of the words. The words on the page were distinct and that made every doctrine and truth distinct. It was as if each word and even each letter stood out with cosmic significance – not that the words themselves were so alive, but that the eternal meaning and truths that the words communicated were alive and throbbing with the meaning – meaning that was alive as far above me as the stars, and as close to me as my own breath. It was as if this eternal mystery of the incarnation was coming true again within the simple speaking of the words. Something happened. A transaction was made between this world and eternity. The words and the actions of the liturgy came alive as I know they always come alive even though I do not always realize it. Then coming away after Mass the thunderstruck realization of why it is so important (as Fr Z says) to “say the black and do the red”. The priest is servant to the liturgy. The liturgy is not servant to the priest. It is only as I submit to the liturgy and live the liturgy and let it live through me that it comes to it’s fullest meaning. This is why it is such a travesty and mistake for a priest to try to make the liturgy “meaningful” by adding his own emphasis, his own comment and his own frightful personality. Instead, the formality of the actions, the simplicity of the gestures and the dignity of the words stand alone and communicate the mystery. Would that clergy everywhere could read this humble and heartfelt narration and then make "the experiment of tradition" themselves! Experience is indeed the best teacher, and many things, indeed the most important ones, never become clear except along that path. Many laypeople also go through the same process of discovery. The first time I ever saw Mass offered eastwards was when I was around the age of 17 (that would have been in the late 1980s). It was a poor venue for the Mass, a long conference room with low ceilings, very crowded, and I could hardly follow the liturgy, since it was completely unfamiliar to me at that time. And yet the moment the priest began to pray, facing the altar, with the entire congregation utterly silent, I knew with a strange certainty that here was a man who, like the child Jesus in the temple, was "busy about the Father's business," and the rest of the people were joining him in spirit with their prayers. The whole thing felt very real, although still very foreign. The moment of interior insight had not yet occurred, since I was still thinking of the Mass as a community event, as something the priest and the people do with and for each other, facing one another in a sort of lecturer/audience relationship. As the years went on, participation in Masses celebrated ad orientem came to feel more and more right, as I absorbed the lesson of this most ancient Christian symbol. We are all facing together towards the Lord, we are all engaged upon the same act of adoration in spirit and in truth. 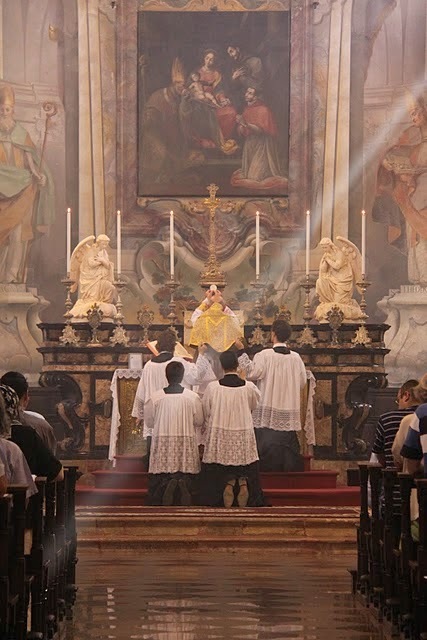 Later on, I acquired language with which to talk about it: the Holy Sacrifice of the Mass is the worship of Christ, the head of the Church, and of his members united with Him, forming one Mystical Body. The priest leads us in prayer, for he represents Christ the head of the Church -- and the head is attached to the body facing in the same direction as the rest of the body, not backwards. Moreover, the East, where the sun rises on our dark world, is a cosmic symbol of Christ, so the priest and people are simply praying towards their Lord and God, who will come again in glory to judge the living and the dead. I can't say when exactly it was, but at a certain point, it all went "click": the whole thing made perfect sense: the Mass is not about us, it's about Him -- and our posture should make that absolutely, transparently clear. 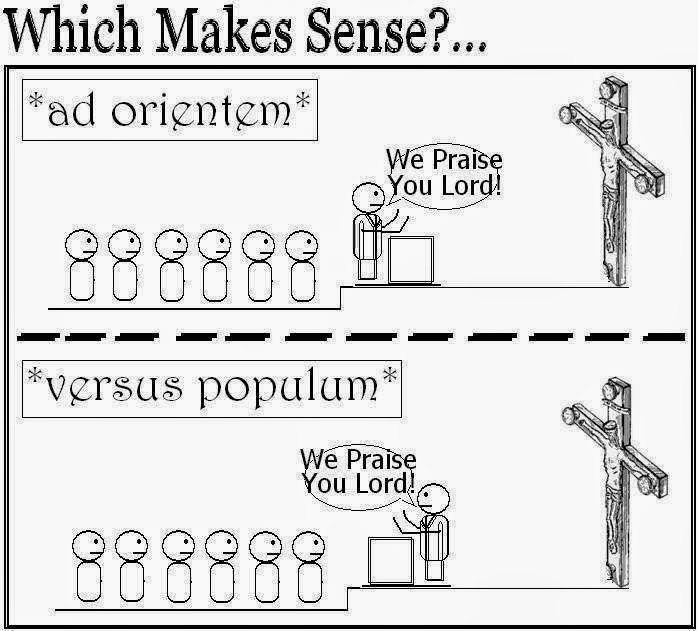 May there be among the People of God, laity and clergy alike, many perceptions, memories, and experiences that, like valiant soldiers making a stand, serve to bring about the rediscovery and permanent reestablishment of worshiping ad orientem, towards Christ who is our true Orient.